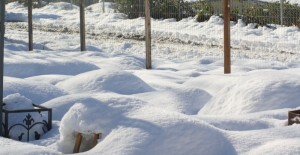 Does your garden look like this? Gardeners, do you ever have a happy dirt dream and then wake up in the morning, look out your window and see your garden covered in a thick layer of white mulch? Do not be disheartened. There’s plenty you can do to get ready for spring. One thing I’m excited to share with you is sowing seed in the winter. This project is economical and wonderful for those that don’t have a greenhouse. So grab yourself a coffee with Irish Cream and let’s have a winter garden party! Wikipedia’s definition of winter sowing is a method of starting seeds outdoors in winter. This is generally done with seeds that require a period of cold stratification. The method takes advantage of natural temperatures, rather than artificially refrigerating seeds. Winter sowing involves sowing seeds in a miniature greenhouse outside during winter, allowing them to germinate in spring. Users of this method have had success in most hardiness zones. With that in mind, let’s make some mini greenhouses! Step 1: Choose your seeds. Wintersown.org has a list of seeds good for winter sowing and that will germinate well in your little greenhouses. Step 2: Rob your recycle bin. 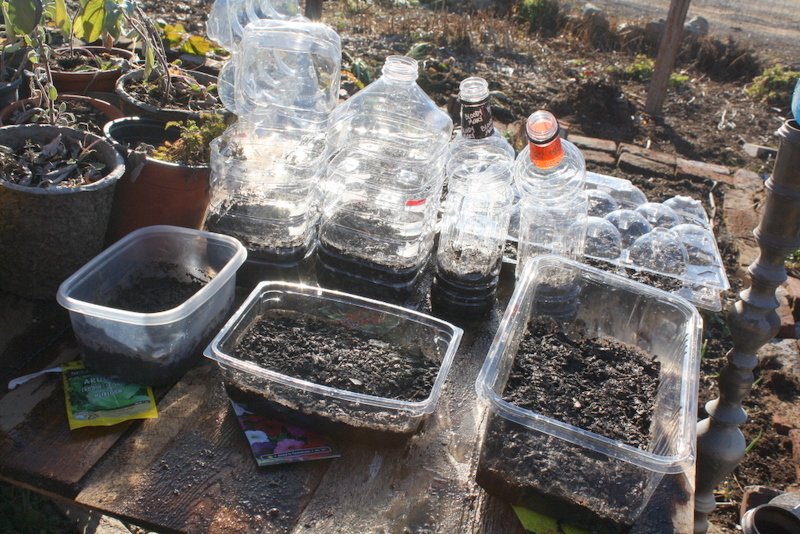 Milk jugs, soda bottles, lettuce containers are all exceptable for planting in, just make sure they are washed and clean. Poke holes in the tops and bottom of the container. (use a sharp razor blade, be careful, wear gloves). Here’s what I started with…Notice the, ahem, bloody mary bottles and water jug are cut around just enough to make a “hinge”. Step 3: Label your containers. All you need in a piece of duct tape and a permanent marker. Step 4: Fill your containers with 2-3″ of potting soil and sow your seed. 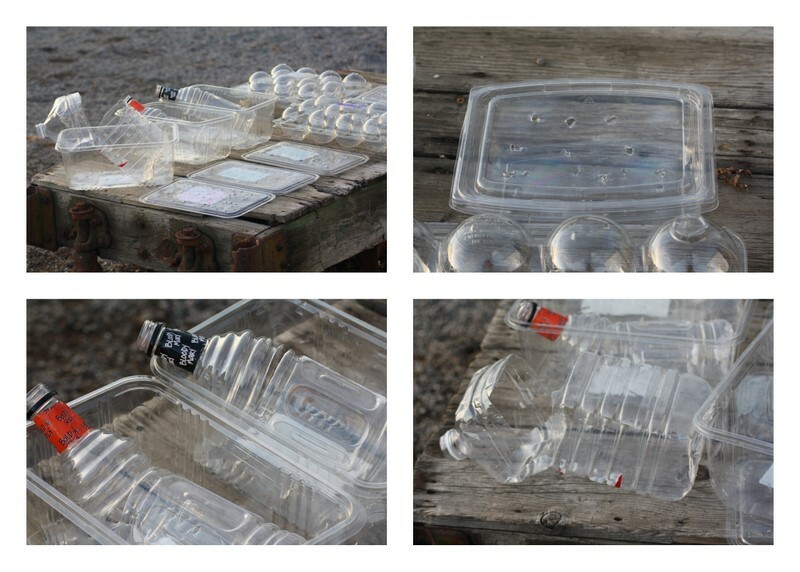 Step 5: Seal up lids and the cut around the water jugs/bottles with a little duct tape. 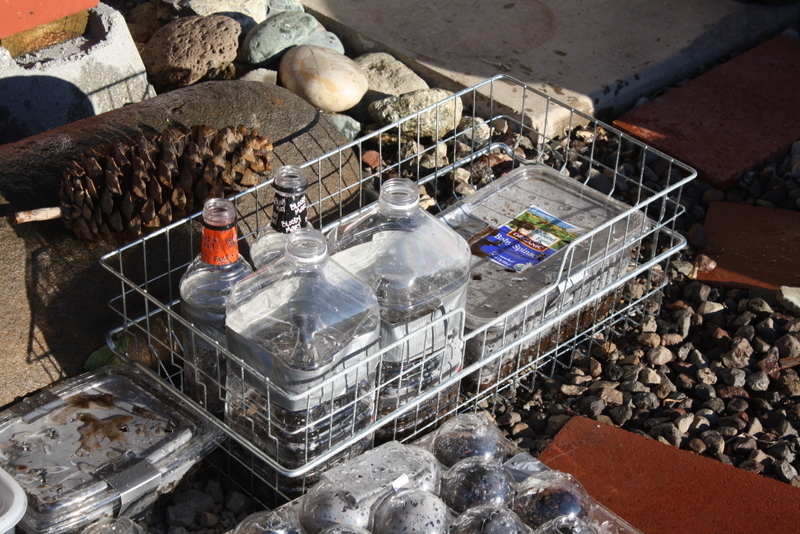 Next, store the containers in a protected area that will be safe from pets and too much rain. Step 6: Wait. If all goes as planned, the seeds will start to germinate as winter comes to an end. As the days start to warm up and the seedlings start to grow, check to see if they need water and widen slits on top of the container for more air flow. You don’t want to bake your little seedlings. In due time you’ll be able to set your plants in the garden when your soil is at the right temperature. Here is a helpful planting guide thanks to gardeningbythemoon.com. For more inspiration check out these Google images on sowing seed in the winter. If your are interested in sharing tips, trends, and asking questions about gardening, please join in #gardenchat on Twitter every Monday at 9pm EST. Also, don’t miss the very special event called #supersowsunday Sunday, Feb 6, 2011 where we’ll be talking seeds while the game is on! Happy planting! Thanks for joining me in my FIRST garden party! 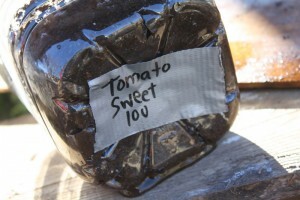 I love this idea of recycling – great way to get some goodies growing the right way! Thanks for sharing your art of sowing seeds. Thanks for commenting on my first blog post Bren. You’ve been such a great support! This is such a good idea! I have spring fever in the worst possible way and maybe this would remedy that just a bit. And it will be a fun project to do with my kids. Thanks so much! Hi Becky! This would would be a very fun project for the kids. Be careful when cutting holes in the plastic. One website suggested heating a knife or ice pick over an open flame first. Happy gardening! Annie, i love the idea of using egg cartons too. Great tip! Great idea….thanks for good information and fantastic links!! Looking forward to seeing the progress of the seeds as they sprout! Thanks Kate! I hope it works I’ll keep you updated. Welcome to the blogosphere! This is such a great article! Do you mind if I post it on my blog (www.growninthecity.com) and direct people over here? I will be trying this out – certainly with snowpeas at the very least – and will let you know how it goes! Hi John! Thanks for your comment. I would be happy if you put the article on your site! Yay! Pingback: Grown in the City » Winter Sowing: Sow Now, Grow Later! Great recycling – I have used a few interesting containers as seeds starters, greenhouses and sprouters myself! I’m still trying to figure out why “with Irish Cream” is crossed out! Loved the post, lady. I’m going to try this someday. It’s so much fun to winter sow! Oh wow-this sounds great! I will be planting my first garden this year and now I am so excited about starting it early. This so rocks! Wow!! My sister is an official blogger. Love it!! Can’t wait to have a garden party with you this summer. I am surely going to give this idea a try. I may start my sowing in early Spring, though. Our weather is a little soggy, even into early summer. Be sure and take lots of pictures of what’s growing on in your garden. I’d love to do a blog post on it! Thankfully, I don’t have to wait for the snow to melt in So Cal. I love your recycling ideas – especially how you cut the bottles so they are hinged. Genius!